Rolls-Royce unveiled its vision of future automotive luxury at the Roundhouse in London last week, a fully autonomous spectacle of opulence called the “103EX”. The self-driving car was designed by Giles Taylor and his team as part of the VISION NEXT 100, a range of imaginative car concepts that not only celebrated BMW’s centenary birthday but aimed to envision what the next hundred years of car evolution will look like. 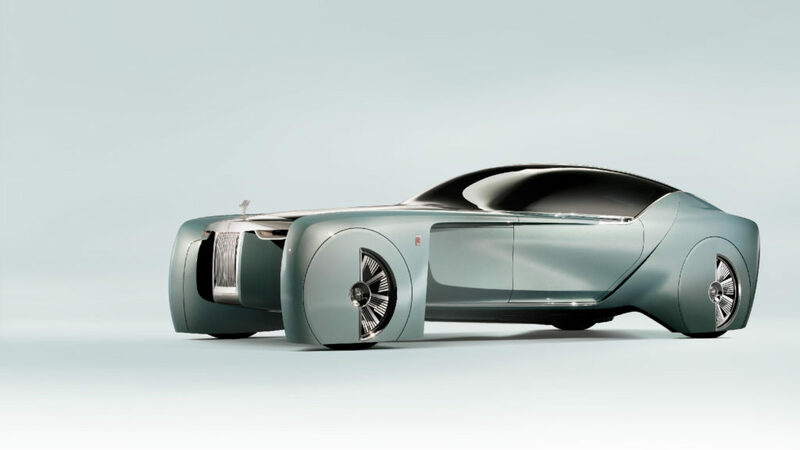 “Rolls-Royce 103EX is our first ever vision vehicle, and embodies just one of the endless possibilities that awaits. A personalised icon for the future, providing a sanctuary of calm in an ever-faster world. The pinnacle of effortless autonomous travel, gliding silently through the cities of tomorrow. 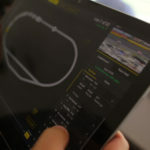 This is our VISION NEXT 100,” Rolls Royce writes on their official website. The 103EX is a colossal machine designed with meticulous extravagance. Nestled within the grand structure, sits a dual 250kw-motor “zero-emissions powertrain”. Its body stretches 5.9-meters long and 1.6-meters tall, enveloping the massive 28-inch handmade wheels and giving the illusion of a floating car. With the absence of steering mechanisms, the free space can be utilized as a secret luggage compartment upon request. The exterior is an astonishing display of polished metal and a two-tone “crystal water” finish, the nose decorated with the signature Rolls-Royce “Pantheon” grille and two suspended laser headlights. And I should not forget to mention the hand-cut glass roof, which allows you to immerse yourself in the world beyond your mobile sanctuary. Its futuristic canopy doors open to reveal an interior space that is the equivalent of a luxury studio apartment. Its sofa-sized seating is lavishly covered in silk, flanked by Macassar wood panelling. The floor is adorned with a snow-white deep-pile wool carpet. Everywhere your eyes can gaze and your fingers touch, you’ll experience masterful craftsmanship. “The entire roof canopy opens up to an inner sanctum, before effortlessly enveloping you. Sink back into expanses of bespoke, rare materials. The skylight is your panoramic observatory, inspiring awe and wonder. The only sound is the hushed beat of your own heart,” Rolls-Royce poetically states. 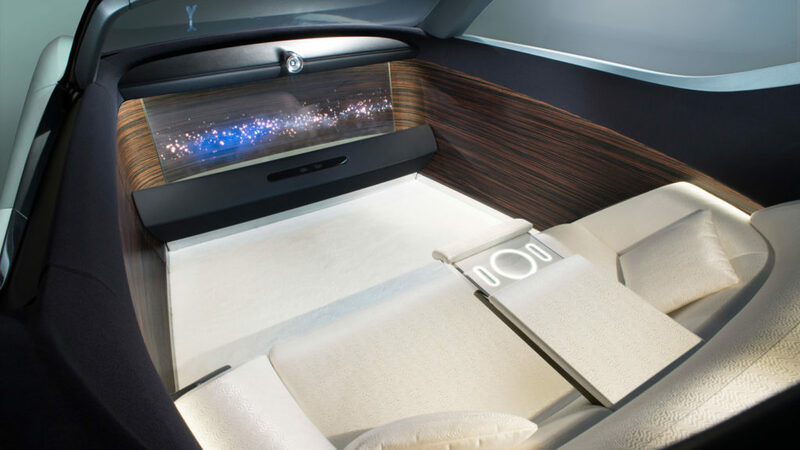 Where once a chauffeur sat behind a steering wheel and dashboard, there is now only empty space bordering against a large flush-fitted OLED display, which serves as an entertainment station and a platform through which you communicate with Eleanor. Eleanor (who gets its name from the late Eleanor Thornton, a British actress and model), is a surprisingly well-spoken artificial intelligence that will act as both driver and onboard attendant. According to Rolls-Royce, Eleanor will be able to assist its passengers in a plethora of ways, from arranging schedules and making route suggestions based on current time and traffic to being able to be called upon for pick up. “Eleanor becomes their virtual assistant and chauffeur, freeing them of all effort and encumbrance. Imbued with her own artificial intelligence, she works intuitively to advise her owners on itineraries, schedules and options before they leave their residence,” the British car manufacturer explained. Rolls-Royce is yet to announce the release of the 103EX and has given no indication of what its cost will be. But we can be sure this extravagant monstrosity will be well out of the reach of us mere mortals, reserved for only the most wealthy and elite individuals of society. A Capetonian freelance writer and photographer, Wiehahn is a lover of stories in all their forms, and has been an avid gamer since he took his first breath. If he is not working or gaming, he either pours his creative energy into his passion for music or plays foosball in some bar.